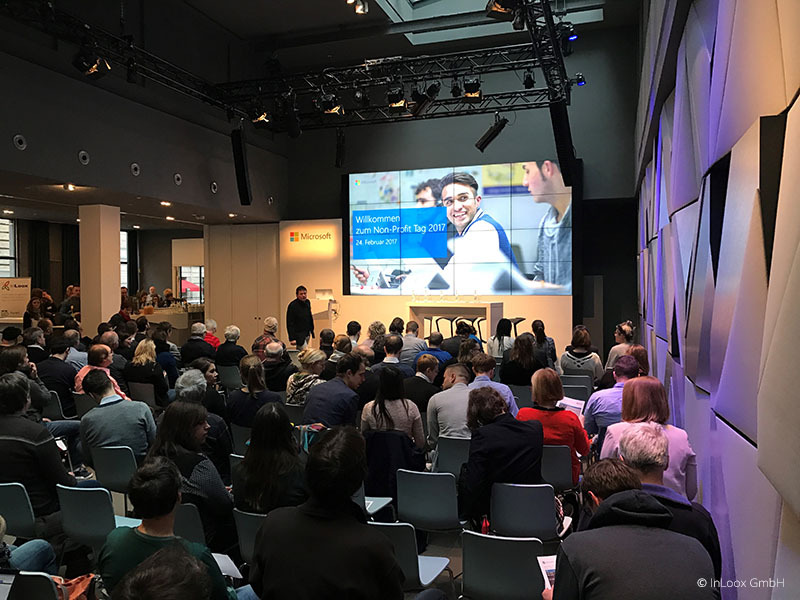 Munich/Siegburg/Berlin, February 27, 2017 – For the 4th time, the IT-platform Stifter-helfen.net-IT für Non-Profits organized the Non-Profit-Day 2017 which was hosted by Microsoft in its office in Berlin, Unter den Linden. The event focused on the topic of "Digitalization of the Civil Society". Dr. Andreas Tremel, founder and CEO of InLoox, participated with his hands-on talk "Make the most of Outlook - from Task to Time Management". Around 200 representatives of non -profit organizations attended the event on February 24th and joined the discussion on the trends in and consequences of the digitalization of the civil society. This development has also impacted the organizations themselves for some time now: standardized procedures, decentralized communication and collaborations in digital environments, or providing digital services via new media and technologies have already taken root in many NPOs. Behind this digital transformation lies of course the need to economize with the limited resources provided. Dr. Andreas Tremel showed how non-profit organizations can work more efficiently and be more productive in their daily business and their long-term projects. His talk he presented simple steps that teams can take to organize themselves via Microsoft Outlook and Exchange: sharing information, collaborating on tasks, and organizing their workflows. The goal was to share his knowledge with the participants and to equip them with tips, tricks, and strategies they could immediately execute. “Once again, I was impressed with the Non-Profit-Day. It is inspiring how immensely NPOs contribute to the wellbeing of our society with very limited resources. We are proud to actively support these organizations in their efforts”, says Dr. Andreas Tremel. InLoox has been supporting various organizations for the past seven years by offering its project management software for free on the IT-portal Stifter-helfen.net. InLoox has helped non-profit organizations manage their daily work and projects efficiently and economically in Germany since 2011. In 2013, InLoox decided to also offer its products to NPOs in Austria and since 2016 in Switzerland as well. This has resulted in more than 150 non-profit organizations benefitting from the collaborative work environment that the InLoox project management software provides. The IT-platform www.stifter-helfen.net has been operating in Germany since 2008. NPOs in Austria have had the option to access IT-contributions since 2012 and since 2013 the platform has been offering its services in Switzerland. In all three countries, the platform is run by Münchner Haus des Stiftens gemeinnützige GmbH in cooperation the US-American non-governmental organization TechSoup. In Austria, they are additionally supported in their marketing, communication and networking activities by their local partner Fundraising Verband Austria. InLoox | Non-Profit Day 2017 | Press release • Copyright 1999-2019 © InLoox, Inc. All rights reserved.